Using an easy-to-understand, step-by-step approach, The 12-Lead ECG in Acute Coronary Syndromes describes how to accurately interpret 12-lead ECGs for effective recognition and treatment of patients experiencing ACS. This 3rd edition simplifies learning with a new three-step method for interpreting 12-lead ECGs, first exposing you to new information, then offering examples, and finally asking you to apply your knowledge. Then it takes 12-lead interpretation one step further by providing strategies to determine the likelihood of the presence of STEMI versus other causes of ST elevation. Written by two well-known educators, Tim Phalen, a paramedic, and Barbara J. Aehlert, a nurse, this guide includes the latest emergency cardiac care guidelines, new research, and new information on treating ACS in both hospital and prehospital environments. The latest emergency cardiac care guidelines are reflected in updated discussions of ACS treatment. More than 300 colorful illustrations, including 31 new photos, depict concepts and skills. Case studies promote early recognition and treatment of problems. Key Point! boxes offer information that you should remember to minimize problems. Fast Fact boxes provide helpful information. Did You Know? boxes provide additional information and the "big picture." Think About It! boxes offer valuable insights into better patient care. Objectives open each chapter to emphasize what should be learned. Key terms are bolded upon first mention to make learning them easier. New content on STEMI recognition includes a streamlined approach and a new emphasis on STEMI imposters (noninfarct causes of ST elevation). An updated approach to ECG interpretation provides simple strategies to determine STEMI after you have identified ST elevation. Four updated, illustrated step-by-step skills have been added, providing easy-to-follow instructions for performing basic techniques. Four new case studies help you apply content to actual real-life scenarios. Landscape view presents 12-lead ECGs in the actual sizes seen in the clinical setting. 12-lead ECG dual-function color overlays help you identify the location of a STEMI. A heart rate ruler is included with every text, making it easier to calculate heart rates. 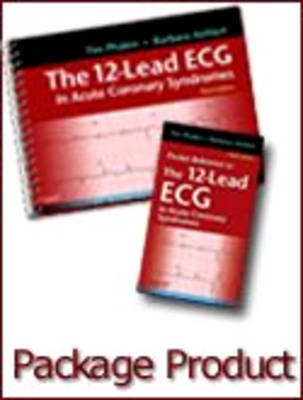 Over 90 new 12-lead ECGs have been added to this edition, for a total of 133. 30 more practice ECGs have been added to the practice chapter, for a total of 100. Spiral binding makes it easier to lay the book flat for study or for use while on the job. A new 50-page pocket reference helps you quickly identify possible STEMI, determine the likelihood of the top STEMI imposters, and confidently categorize the ECG. Included in this package and also sold separately.